The Peregrine Falcon has the characteristic of habit of perching on rocks and appears to love the loftiest and most craggy cliffs. It makes its nest in spots which are virtually inaccessible to man, and could only be reached by a bold and experienced climber. 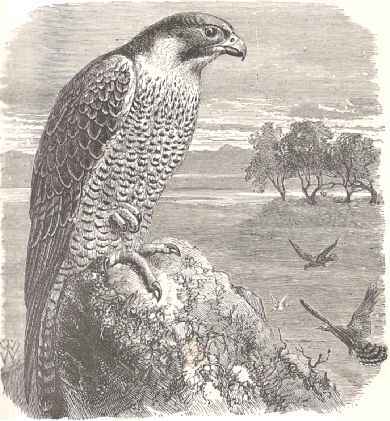 The nests of this bird are never built in close proximity, the Peregrine preferring to have its home at least a mile from the nest of any other of its kinsfolk. Sometimes it makes a nest in lofty trees, taking possession of the deserted home of some other bird; but it loves cliffs better than trees, and seldom builds in the latter when the former is attainable. In his 'Land of Israel,' 19th century scholar H.B. Tristram gives several notices of this bird, from which we may build an interesting picture from a description of a scene at Endor. 'Dreary and desolate looked the plain, though of exuberant fertility. Here and there might be seen a small flock of sheep or herd of cattle, tended by three or four mounted villagers, armed with their long firelocks, and pistols and swords, on the watch against any small party of marauding cattle-lifters.